They say that staying in is the new 'going out', but that doesn't mean that you have to become a social recluse! 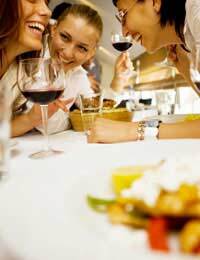 Dinner parties are still just as popular as ever, with many people ditching expensive wage-eating restaurants and nights out in favour of a night in with good food and friends. But hosting a dinner party may seem like just another expensive way to entertain friends and family. This is not necessarily the case, if you plan well and exercise restraint! This article explores how to through a fabulous dinner party whilst maintaining a low budget. If you're planning on hosting a low budget dinner party, you need to be realistic about just how many people you can cater for on your low budget. After all, you don't want to have to scrimp and serve up measly portions to your dinner guests! So the first tip is to try and keep your numbers as low as you can, so that you can maximise your budget 'per head'. It's a simple tip, but it's probably the most important! The second useful tip for hosting a low budget dinner party is to plan, plan and plan some more. If you want to keep your budget low, you will most likely be cooking from basic, fresh (and cheap!) ingredients – but you'll need to not only calculate your costs. If you're buying fresh ingredients, try and pick them up as close to your dinner party date as possible. That way you don't run the risk of food perishing and having to bear the cost of replacing it or running out of vital ingredients. Without leaving it too late, try and head to a local supermarket or outdoor market nearer to the closing time, when reductions and special offers are more likely to be on offer. 3. You could also try incorporating dried ingredients that can be bought in high volume at low cost – think pasta, couscous, rice, lentils and chickpeas as a starting point. All of these seemingly innocuous ingredients can be combined with the right fresh ingredients, herbs, spices and seasoning to make some truly fantastic dishes. Salads are also cheap and can serve as side dishes or garnish. Check out world cuisine cookbooks for some cheap one-pot-wonder recipes that'll leave your guests wanting more. For desserts, think simple but full flavoured – cheesecake, ice cream or a rustic apple or fruit crumble (check out the frozen fruit section of your supermarket) with custard are all tasty, low budget options. Once you've got your ingredients, you'll then need to do some research to find the best economically-priced beverages to accompany your meal. If you're serving soft drinks, go a step further and add a slice of lemon and ice to the pitcher to add a touch of elegance. If you're serving alcohol, check online for bargains, as well as any wines or beers on offer at your local supermarket. And don't be afraid to ask for assistance – a good supermarket should have a wine specialist on hand to help you choose. Likewise, even a small local independent wine supplier may be available to supply you with a good, cheap wine that will complement your menu – and if you're brave enough you could even try bartering a discount if you're buying a few bottles! Another great way to host a low budget dinner party with all the trimmings is to set out your table well. You don't need to break the bank to do this, but small touches can make all the differences. Borrow a table cloth and set out placemats with rustic home-made name cards, put out your best glasses and silverware, a few jars of flowers, and have a few tealights or candles burning to create a more intimate, cosy atmosphere. If you have the time and the inclination, you could even make your own table napkins or table runners from recycled fabrics. To finish your meal, offer coffee and mints – this is a fantastically economical way to cap a delicious meal, and offers a great round up to an evening with friends or family.